Card games are always a favourite with young children and MyGo is no exception. 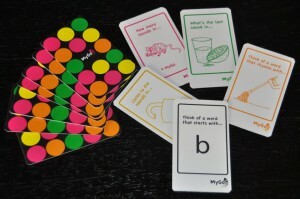 For children who need that extra practice for their phonological awareness skills (but you're running out of new ideas), MyGo helps to put the fun back into therapy. It can be played with just about any group, from two to six players. The cards are professionally printed and brightly coloured, sure to appeal to any client group. The game features four different suites each of which is a different phonological task - rhyming, word segmenting, sound blending and sound identifying, and one wild card suite which covers sound-symbol association (or intial sound word generation). There are special cards for missing a go, reversing the go, having another go, and picking up extra cards. Of course the players can't have their turn until they do the activity on the card they want to play! We're confident you'll enjoy this game, too! This game is also great for those children in their pre-formal school years who are ready for some extra literacy stimulation, to complement early writing activities.